Eric Berne defined a stroke as one unit of recognition. In order to understand this definition fully I like to ask the question “How do you know you exist?” To help you along with this question, just imagine for a moment that you were completely invisible. You exist but nobody can hear, see, or feel you. How long do you think it would take before you changed your view about existing? We need others to validate us, to recognise us, to look into our eyes and be responsive to us in that very moment. A small act that is paradoxically so simple and immensely complicated in its delivery, it’s acceptance, and it’s process. To witness the simplicity of one human stroking another in its most purest of forms, one only needs to observe a mother and her newborn child. To witness it at its most complicated take a good look around you. You will not need to look far. Strokes can be as simple as a ‘hello’, eye contact, an expression, a touch of the hand. Depending on who is saying it, and in what circumstances, can be the difference between a tiny speck of a stroke (barely nourishing) and a big juicy loaded stroke. I remember vividly as I walked out of my vets consulting room, carrying my deceased cat in the same cat carrier I had used to take her in with, that despite my attempts to compose myself in the consulting room, by the time I reached the waiting room I was sobbing. The waiting room was full and for a very short amount of time all faces looked up at me, and in that same moment, as if everybody had rehearsed some kind of synchronised dance they all looked down at the floor away from me. This is one of my invisible moments and although many years have since passed (since 1999), it still feels like it happened yesterday. So why the subject of pets and stroke theory? 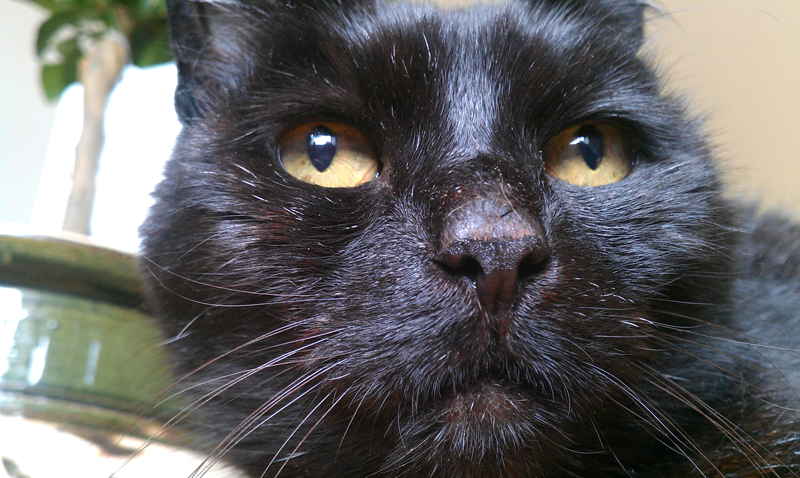 Some of you will know that we said goodbye to our 21 year old cat (pictured above) in February 2013 and that we have been rather pet-less since. Although I was aware of how I personally gained many strokes through my cats over the years, living in a pet free environment has really highlighted just how important these strokes were. As time has gone on (it’s about eight months now) I have noticed a growing sadness and almost a sense of loneliness – I am undernourished (stroke wise). Knowing how you get your needs met is often an essential part of the psychotherapeutic journey (therapy). Bringing your stroke patterns into awareness is one way of doing this When we are aware of how we gain, give, reject, hold on to, and receive strokes then we can evaluate our effectiveness in nourishing ourselves, and make small gentle changes in how we get our needs met on a healthy way. Intimacy yields the best and juiciest strokes, however it also requires taking a risk. Going back to my experience in the vets waiting room, an intimate moment would have occurred if one of the onlookers had maintained contact with me. The none verbal message might have been “I feel your pain” as the onlooker would have connected with the deeply felt grief of losing their own pet and simultaneously, and momentarily would have experienced and shared my own pain. We both would have experienced a deep sense of being seen and acknowledged by the other on a very personal level. A highly nourishing exchange of strokes would have taken place in that moment. Exposure of our inner selves, our vulnerabilities can result in feeling hurt in some way if the other decides not to acknowledge our presence. I tried to compose myself prior to walking into the waiting room, and the onlookers blocked out stimulus by looking away. These behaviours serve to protect us and also deny us the experience of true intimacy and nourishment. I remember this experience vividly because I felt both the pain of loss, and the pain of feeling alone and invisible in a moment of sharing my inner despair in a crowded room. However I do not wish this memory or experience away, quite the opposite actually. My love is commensurate with the loss I feel – I do think it is better to have loved and lost, than to have never loved at all (Alfred Lord Tennyson’s poem In Memoriam:27, 1850). So on reflection, I can’t think of any other experience in my Adult life that has taught me so much about the concept of strokes, and how us humans have a tendency to most move away from intimacy if there is a slight chance we may be hurt by another. I also have learned the value of having pets around me, that I get a daily dose of intimacy without the high risk of feeling hurt. Right now I feel like my home has lost some of it’s soul, and I know it won’t be too long before I say hello to some new furry stroke givers. I invite you to notice your pattern of stroking. How do you give/receive strokes? Who do you give/get them from? What kind of strokes are they (negative, postitive, being, doing, conditional, unconditional)? What rules do you have around strokes (“ask and you don’t get” etc)? And finally – are they big fat juicy strokes, or do you search around for small scraps? Notice your corresponding risk level – and ask yourself if you happy with this? Now I’m not suggesting you all immediately go out and buy a pet to address any stroke deficits, pets are a rather large commitment that take up large chunks of time, energy, attention, and money! However they can be a consideration as part of a bigger plan to enjoy and experience intimacy and all the strokes it has to offer (giving and receiving). If you already own a pet, and one day you are sat in the vet’s waiting room bearing witness to another’s deep pain, perhaps you might take a small risk and make eye contact. Yes you might feel your sadness, yes it might hurt, however you will also get one of those ‘best and juicy’ strokes I have been talking about. Berne, Eric (1964). Games People Play – The Basic Hand Book of Transactional Analysis. New York: Ballantine Books. Berne, E. (1971). A layman’s guide to psychiatry and psychoanalysis. London: Penguin Books.